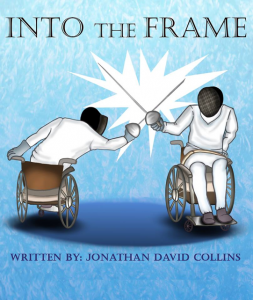 In the latest instalment of our series introducing people from our fencing world, we hear from Jonathan Collins, author of ‘In the Frame’ a book about wheelchair fencing. 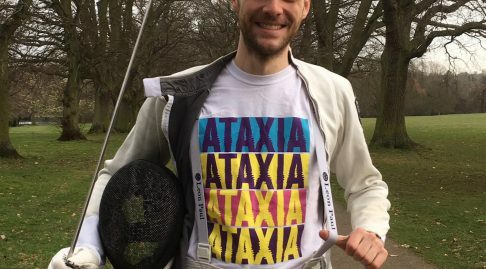 Here, he shares how he discovered fencing and what made him decide to write a book about the world of Wheelchair fencing. “Sport had not been a big part of my life. 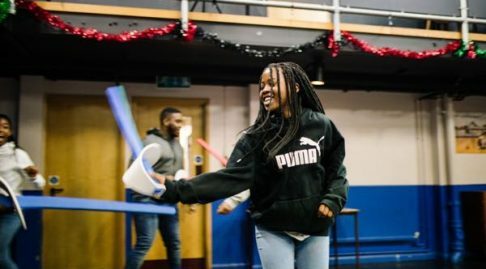 I had tried several taster sessions for people with disabilities but I didn’t feel at ease with any of them and Wheelchair Fencing wasn’t even mentioned. It wasn’t until a few years later that a friend mentioned there was a Fencing club that encompassed Wheelchair Fencing only 10 miles from my home. I went along and I was hooked. I enjoyed the whole experience. I met my trainer Viv Mills, and she taught me some basic rules and moves. Then with the weapon in hand I tried to score some points against my opponent. The challenge of learning something new was amazing. I felt alive! 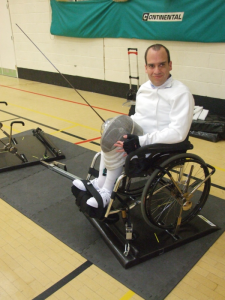 Question: Why had I not found the sport of Wheelchair fencing earlier? Answer: Probably because there is a lack of awareness of the sport. What could I do to improve this? I trolled the web looking for books to explain what Wheelchair fencing was all about. There just weren’t any. I had posted a video of myself fencing on social media. In the video the weapons had been changed to lightsabres. This generated a lot of interest and I received e-mails from all over the world. A lady called Sonia Sanghani from Swansea contacted me. 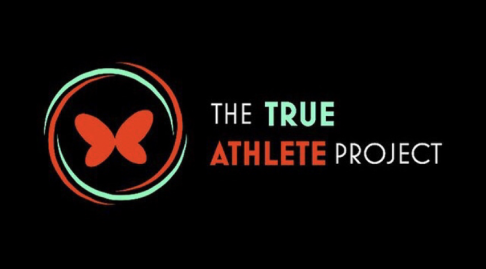 She had written a book on cycling for people who are amputees and was in the process of trying to make people more aware of sport for people with disabilities. She was trying to encourage people to write about their specific sport. I had never done anything like this before and with my disabilities I knew trying to write a book would be challenging. Progress was quite slow at times, researching facts and trying to ensure they were correct took a lot of time. However I managed to cover a bit of History of the sword and History of the Sport, equipment required and tournament etiquette, rules and regulations. I also have managed to get life stories and photographs from Wheelchair Fencers and officials from all over the world. The stories have been written by club fencers, retired fencers, top ranking world and Paralympian fencers. I will admit there were times when I found writing the book was all too much and too stressful and I felt like giving up on the project. However Sonia was always at the end of the phone or quickly replied to an email. Her help and encouragement always saved the day for which I am truly thankful. The book was written to give an insight into Wheelchair Fencing. It covers basic facts and information and is easy to read and understand and I hope it will inspire a new generation of wheelchair Fencers. 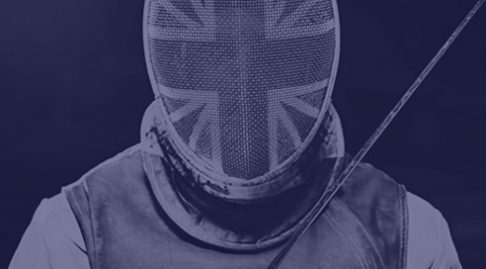 Wheelchair Fencing is not widely known in this country but we do have Paralympians winning medals and world class Wheelchair Fencers who achieve gold, silver and bronze on a regular basis.